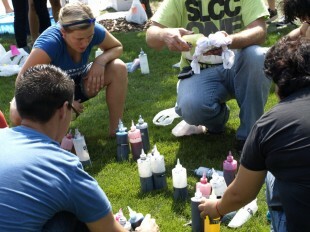 On Friday, Aug. 24, Salt Lake Community College greeted the new semester with a twist and a splash of color. The annual Tie-dye Fest filled the SLCC Taylorsville Redwood Campus’s west patio with students, friends and family intent on making a colorful new addition to their fall wardrobe. Student Life and Leadership sponsored the event and provided free tee shirts, brightly colored dyes and help with folding up the perfect tie-dye pattern. For more information on upcoming events at any of the SLCC campuses visit the Student Life & Leadership’s OrgSync page. For some, picking out the perfect color was the hardest part. Harris Kisija decides on the finishing touches for his wearable work of art. 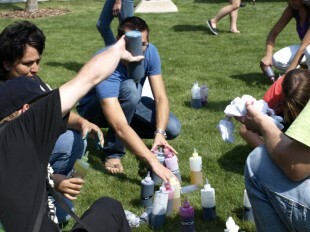 SLCC Student John Beck shows off his favorite part of the tee-dye process. The tie-dye fest gave students a chance to meet some new people and catch up with old friends. Seth Ipson, left, and Kati Sanderson work together to create their tee shirt. 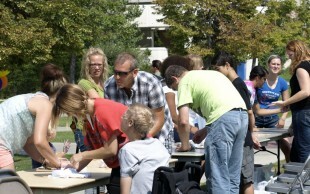 Student Life and Leadership provided free tee shirts, colorful dyes and instructions on how to make your own tie-dye.